This Christmas, have a festive, musical tree-lighting ceremony right in your very own living room every single time you switch on the lights with this cool new Hallmark Musical Tree-Lighting Snowman. 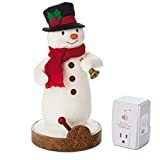 Just flip the switch on the base of this whimsical plush snowman and it raises up its trumpet, wirelessly turns on the Christmas tree string lights, and plays one of five classic Christmas carols. 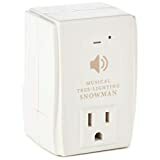 Just plug in the receiver to your string lights (additional receivers available to plug in more lights) and place the snowman within 50 feet. A fun and magical way to light up your holidays. Check out this video to see it in action. Cool huh?